I'm thinking of sponsoring a new contest. One that won't necessarily take writing or drawing skills, but will instead require a devious mind and a heap of creativity. What do you think? YES! YES! PLEASE DO!!!! I LIVE for your contests! yes yes yes yes yes yes yes yes yes!!!!!!!!!!!!!!12111111!!! What'll it be? what ever it is, you have to do it. That would be soooooooooo awesome!!!! contests are very cool! I love the picture!! And the contest sounds like a lot of fun. Sounds interesting! I’m really curious. I’m allowed to enter...right? Heh. Heh. YAY YAY YAY YAY YAY YAY YAY!!!! did i mention YAY!? i think YAY!!! YES! YES! DO IT!!!!! GO FOR FOR IT! PLEASE!!!!!!!!!!!!!!!!! DO IT DO IT DO IT DO IT!!!!!!! I stand ready to attempt deviouscity... deviousness... devious-mindedness... whatever. Naw, I don't think you should......JK! YES! 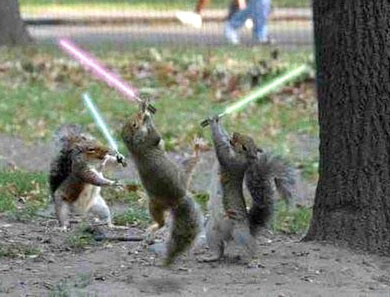 aw the squirrels are soooo cool! awesome! Holy crap, this is amazing! And please do! It would be awesome! the people have spoken... go for it! Only punctuation can express my joy. YES! I wasn't here to enter the others... Again, YES YES YES! Yes yes totally! Cant wait! thanks for all ur posts!